Right hand, have you met left hand? Guest author Peter, reading yet another news item fretting about growth and land for development, and yet another item fretting about traffic in Wellington, wonders if he’s going a bit cuckoo. With elephants and cats. “Region facing development land deficit” worries the latest in a long string of media reports about development, population growth and the Wellington region that chatter away with “insight” in the shadow of an enormous elephant. This mighty beast goes unmentioned so often I’m beginning to feel like one of those crazies who mutters to themselves “is it possible people can be so BLIND!!?!! ?” (complete with True-Blue Crazy block capitals and multiple exclamation marks). You know the elephant I’m talking about right? It’s the one where people say “our population is growing” and “we need more houses” and “we need more sections” and “we need more greenfield development land” and “we need to unlock/open up/unleash more rural/open space/reserve land for housing!” and then in the same breath, or in different interviews a few days later “Wellington [/Paremata/Petone/Hataitai] traffic is terrible” “we need to do something about it” and “it’s only going to get worse” – in one councillor’s poetic description, there’s an “onslaught of cars” coming from new developments and the big new roads. And looming quietly over all the chatter: Elephas giganticus densitus residentialis, or the enormous elephant of residential density. It’s a really, really big one – but it’s one we’re stubbornly refusing to talk about. This entire problem – the whole premise of the article – is that there’s too little land currently available…. “based on existing residential subdivision plans which allows (sic) up to 12 houses per hectare”. There it is, that huge pachydermic shadow. Yes Grant Henderson is an expert, by one definition. (I can reasonably assume he has a lot of experience in buying and selling land). But as always incentives go unstated, and that matters when there’s only a few people quoted in an article. Yes everyone’s got a barrow to push, on something, but please let’s remember when we’re listening to authoritative experts: both developers and real estate agents make by far the most profit from selling houses in traditionally-laid-out suburbs, and even lower density, high-end quasi “rural residential”. In other words, bijou lifestyle blocks. Now tai hoa for a moment on this developer bashing – let’s be reasonable. It’s not developers’ job to do what’s in the public interest – and it’s stupid to expect them to do so. They are in the trade to make money, which is fair enough. And for many reasons it’s too hard right now to make similar money off less sprawling developments – some good points on that here. 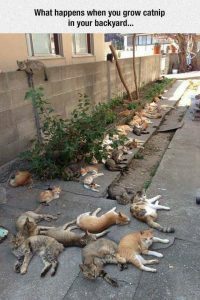 But hey, we wouldn’t ask cats about the ideal ratio of plants in our garden, and be surprised if they always said “at least 80% catnip is the ideal, and most of the rest should be places to have a nice lie down.” We know: cats are programmed by nature to do this. So sure, ask the cats – but ask some other garden users too – maybe some people without such a vested interest in promoting a particular type of layout and content. What about those people who study this stuff for a living? There’s an idea. Surely the journalists, who are writing about this stuff off and on for years, know where those people are. I‘m not one of them – I don’t even think about this stuff much. The future isn’t looking good. That’s my future. I’m talking about ten years from now. We already know it’s stupid to keep doing things the way we have and expecting magical difference – Einstein famously said this as the definition of madness. But we’re special in Wellington, we hear that a lot. So never mind, let’s just keep doing subdivisions the way we have, create the enormous rod for our backs, then when it beats us, wail and spend more money. Wail about the traffic, lament our fat, clingy children, who stay dependent long after they should have flown, and bemoan the loss of family and community cohesion because people spend 20% of their waking hours trying to get around. Never mind, let’s spend 2018 make gentle, feeble noises like the quoted Councillor and officer from Wellington city – no other cities, mind you – about “encourag[ing] developers to build more houses closer together” and having an inquiry to “establish if [Wellington] city could hold another 40,000 houses” (emphasis added). Let’s keep watching while property booms drive (yes, pun intended) more big new roads enabling “an hour’s drive to Wellington” and let’s keep welcoming conversions of forest to lifestyle blocks. And let’s continue only to listen to developers and real estate agents. And let’s keep talking about houses, houses, houses instead of homes, or dwellings, or places to live. And let’s keep doing the stuff we’ve always done, hoping for a different outcome. Perhaps that’s the madness here that invokes the multiple exclamation marks of craziness. But here’s a silver lining for you: maybe if we start throwing our hands up and wringing them, at least there’s a chance they might start coming together a little. Does Wellington’s current housing market let you “reveal your preferences” – i.e. live the way you want to? If not, what do you want that you can’t find? I couldn’t agree more with this and the questions raised in Plimmerton Farm. Hopefully the balance will tip, over time ,if commentary like this reaches the right people. ( excuse the pun). Wellington can indeed contain another 40,000 dwellings – just not 40,000 houses. See the difference? density is fine for Wellington city, this is Plimmerton Farm. = suburbs. = people who like their space, to have some lawn and garden for the kids.